UFO SIGHTINGS DAILY: Incredible giant UFO has people running away in fear, Oct 2015, UFO Sighting News. Incredible giant UFO has people running away in fear, Oct 2015, UFO Sighting News. This hit the news today and its a very cool sighting. Russia is known for its UFOs and this is one for the history books. The UFO is low over the building and has two orbs above it, used like sensors of sorts. These orbs are often seen buzzing around UFOs, some measure only a few inches. The latest unidentified flying objects in the capital of Buryatia have had the social media buzzing in recent days. 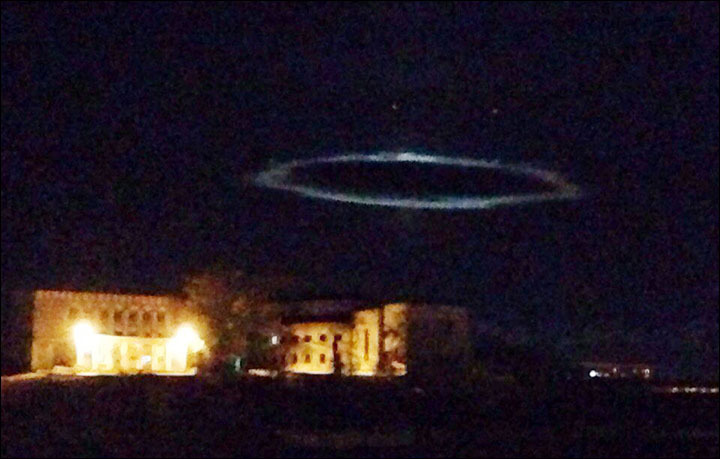 A woman reported seeing a 'glowing' entity in the sky above Ulan-Ude with 'a lot of green lights, some red and blue'. She watched with her son and male two passers-by as the mysterious object disappeared and then reappeared 'very close', making a noise like the engine of a car, she claimed. The men at first claimed it might be a toy plane or drone. 'When it stopped right above us, I could not say a word and saw the two men running to hide in a building,' said the woman. 'It was a very large saucer with bright green lights in the middle. My son got scared, grabbed my hand and we ran away. I never believed that something like that could exist.' (more at source).